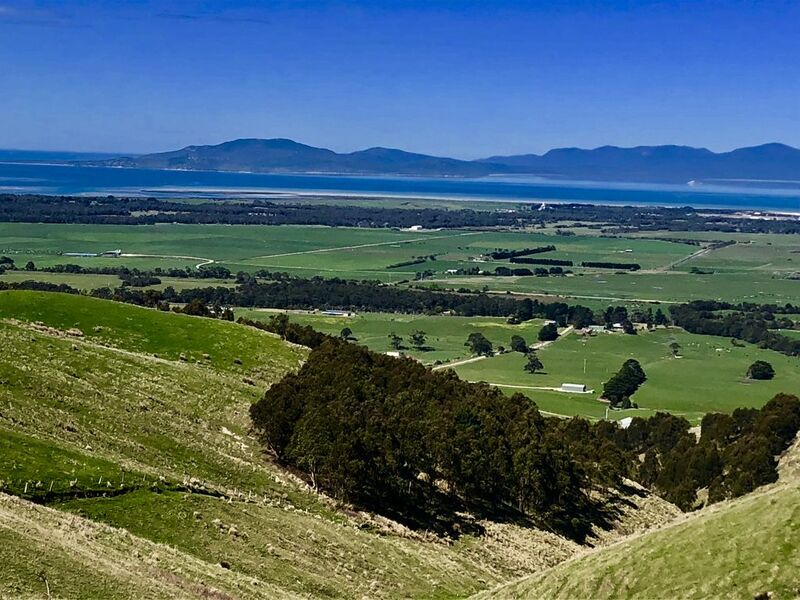 Lockie's Lookout sits on the very top of a grassy hill, 2.5 kilometres as the eagle flies from Corner inlet with a landmark cypress tree and an unforgettable 360° panorama across Corner Inlet, Wilsons Promontory, Bass Strait, the Strzelecki Ranges and lush South Gippsland grazing country. The property offers private, elegant and comfortable fully self-contained accommodation for up to six people. 7 if you sleep on the couch. Lockie's Lookout's main lounge is combined with a dining area, overlooked by a fully equipped galley-style kitchen. The house features a floor to ceiling glass wall running its full length (24 meters) facing the Prom and Bass Strait over the main deck. In addition to this view the Strzelecki Ranges can be viewed through the kitchen, the rumpus room and the other lounge room window. There is a wood heater, reverse-cycle air-conditioning and flat screen television with CD and DVD player. There is parking for 3 cars and an outside BBQ on the rear deck. The house features two queen bedrooms, one with an ensuite bathroom including a bath to sit in, open the window, relax and soak up the extraordinary view. There is also a rumpus room with a queen bed and centrally located second bathroom. Each room opens onto the main deck and all beds are fitted with electric blankets. There is also a compact European laundry, with an automatic front-loading washing machine and dryer. Lockie’s Lookout is a new-wave retreat that's perfect for couples, groups of friends and families all year 'round. if you do not want to "sleep in" then you can wake to the sunrise and retire to the sunset. Walk to Agnes Falls, visit the restored Port Welshpool jetty, ride your bike or walk on the historical South Gippsland Rail Trail, explore the surf beaches and walks of Wilsons Promontory, visit the ferns and rainforests of Tara Bulga National Park, have fish and chips on the jetty at Port Albert, pick up some oysters and prawns from Foster and laze around at Waratah Bay, buy some fresh fish off the jetty at Port Franklin or simply stay home and enjoy the ever changing view. If this property is "not" available on your "preferred dates" we have two other houses located on the same farm in the sky (a long way apart for privacy) with the same sensational views of Wilsons Prom, Bass Strait and Corner inlet. Go to Stayz "One Tree Hill 360o views incl Prom & Bass strait" and or "One Tree Hill Eagle Nest- Prom/sea views"
I am retired. My passions are One Tree Hill, George my Boarder Collie, Andrea my friend and Captain Jack my Catamaran moored on Lake Macquarie. The Views, One Tree and the challenge of developing a vacant windswept grassy hill into a secure accommodation venue. Views and proximity to other tourist destinations. There is an ensuite of the master bedroom with a bath providing extraordinary views of the Prom and Bass Strait as you bathe. Both Bathrooms are tiled in marble the second one has a shower no bath. There is a wood burning Combustible heater. Linen and towels can be provided for a one of fee of $25. One Tree Hill is an exceptional accommodation destination that provides a magical environment to relax and play. It truly is a stay you will cherish and remember for a log while. We look forward to your visit. We had bad luck with rainy weather but it made no difference as the fireplace and huge windows made it possible for us to enjoy the amazing scenery while being warm and cozy. Would definitely go again! This is a unique property with everything you could desire for a peaceful time away from home. If you are relaxing , catching up on work or study, or in the holiday mode this is the ideal place. Very nice and beautiful property. We stayed with kids and traveled to Agnes in the summer. It was very hot and there were plenty of flies around the area. The property is very nicely positioned with great views. Lockie provided very clear instructions on getting to the property as well. Overall I would recommend staying in this properly. Was more spacious than i thought for 2 containers joined together. was very toasty and warm inside considering how low the temp got outside. just needs a few little extras like tea towels, a bin, and a dish rack. Otherwise, very comfortable. We all enjoyed the amazing views and walks through the fields with the sheep and cows. You can visit Agnes Falls 2 km away, walk on the beach and long Jetty at Port Welshpool 10 mins by car and fish the jetty and look at the boats at the same time. You can visit the Rain forests of Main Ridge Road and Tara Bulga National Park have fish and chips on Port Albert wharf, enjoy a typical Aussie Pub meal at the Victoria Hotel Alberton, site see the historic towns of Toora, Welshpool Port Albert and Yarram, surf the beaches of Waratah Bay and the Prom, ride the rail trail from Leongatha to Yarram, Paddle your kayak around Little Snake Island or up the Agnes River from the Toora or Port Welshpool Boat Ramp, fish Corner Inlet from the Port Welshpool Jetty or your boat, visit the cider factory or the pear orchard or the Silcocks hill wind farm.